Directions FOLLOW THE INSTRUCTIONS. Instructions in Spanish included. 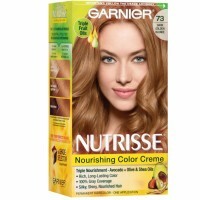 Uses Experience Garnier Nutrisse, a Nourishing Color Treatment that gives you rich, healthy-looking color that really lasts. 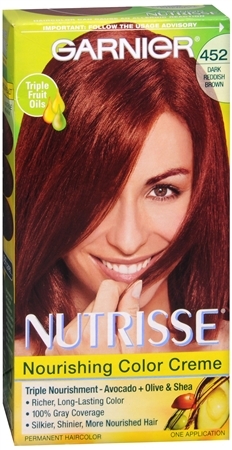 The exclusive color treatment, enriched with conditioners and fruit-oil concentrate, penetrates into the hair fibers to nourish deep down while delivering rich, long-lasting color. Nourishing Avocado Oil Conditioner: Enjoy the unique avocado-enriched conditioner that harnesses the restorative properties of avocado oil with Vitamin E. It nourishes hair and protects against dryness, locking in color and moisture to keep your color rich and healthy-looking and your hair silky soft. 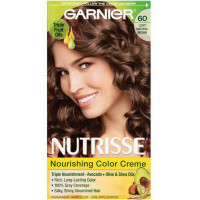 Spreads Easily, Won't Drip: Love coloring your hair with the rich creme formula enhanced with the fragrant grape seed oil you only get from Garnier Nutrisse. It spreads easily, won't drip, and the grape seed oil smells great while you color. 100% gray coverage. 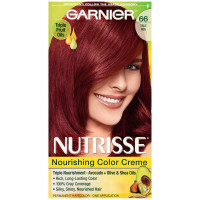 Warnings IMPORTANT: HAIRCOLOR PRODUCTS CAN CAUSE AN ALLERGIC REACTION WHICH, IN CERTAIN RARE CASES, CAN BE SERIOUS. 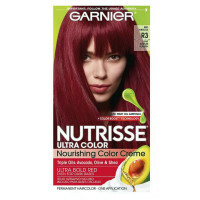 THEREFORE, BEFORE YOU USE THIS PRODUCT IT IS NECESSARY TO FOLLOW THESE PRECAUTIONS: DO NOT USE: if you have already had a reaction to a haircolor product; you have a sensitive, itchy or damaged scalp. PERFORM AN ALLERGY TEST WITH A PORTION OF THIS PRODUCT 48 HOURS BEFORE FULL APPLICATION (SEE THE INSTRUCTION SHEET). Avoid contact with eyes and skin (other than areas of application). If product gets into eyes, rinse with lukewarm water immediately. Wear gloves provided in kit. Thoroughly rinse hair after application. Do not use for anything other than coloring your hair. Wait at least 14 days after bleaching, perming or relaxing before coloring. Do not use over compound henna or progressive color. Do not inhale or ingest. Keep product out of the reach of children. Store between 50 degrees and 80 degrees F. CAUTION: THIS PRODUCT CONTAINS INGREDIENTS WHICH MAY CAUSE SKIN IRRITATION ON CERTAIN INDIVIDUALS AND A PRELIMINARY TEST ACCORDING TO ACCOMPANYING DIRECTIONS SHOULD FIRST BE MADE. THIS PRODUCT MUST NOT BE USED FOR DYEING THE EYELASHES OR EYEBROWS; TO DO SO MAY CAUSE BLINDNESS.